This week, the Roadshow rolls into Manchester’s Media City UK. Treasures include a sketch by Lowry done on the back of a restaurant bill and a battered Blue Peter time capsule. This week, the Roadshow rolls into Manchester’s Media City UK, home to some of Britain’s best-loved television programmes, including Blue Peter and Coronation Street. 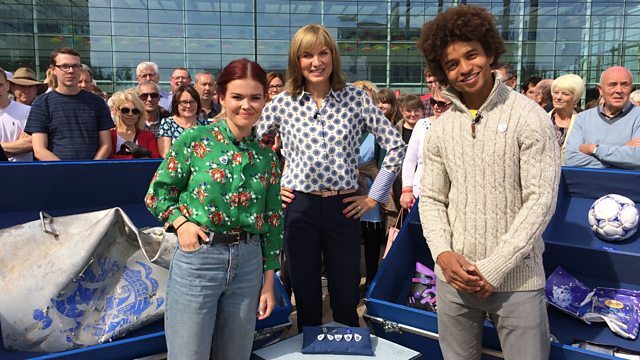 Fiona Bruce meets Blue Peter presenters past and present and reminisces over the treasures hidden in their unearthed time capsules. Pictures expert Dendy Easton values a drawing by Manchester artist L.S Lowry drawn on the back of a restaurant bill, and John Axford is set the challenge of drinking from an 18th-century 'puzzle jug' - but can he down the contents without spilling a drop? And militaria specialist Mark Smith values some albums of World War Two badges that he describes as 'a collectors dream'.